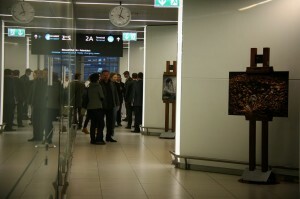 Budapest, Hungary, 2013-11-11 — /travelprnews.com/ — Budapest Airport inaugurated an exhibition space along the corridor linking the arrivals levels of Terminals 2A and 2B. The exhibition area, called BUD Gallery, will primarily be used to accommodate photography exhibitions. First to be displayed are a series of photographs depicting the works of contemporary Hungarian jewelry designers. The new exhibition space called the BUD Gallery, located in a public area of the SkyCDourt, was officially opened on Thursday 7 November 2013. Budapest Airport plans to primarily showcase the high-quality works of Hungarian artists, with new exhibitions to be presented every 4-5 months. Based on international experience, such exhibitions are likely to elicit significant interest in Hungary, as there are countless examples worldwide of airports utilizing passenger circulation areas as galleries. Budapest Airport organized the first exhibition, opened today, together with the Pro Jugendstil Art Foundation, which seeks to support young, talented artists. The exhibition relates to the foundation’s 2012 Hungarian Contemporary Jewelry project, which has already seen jewelry exhibitions organized at the Hotel Corinthia in Budapest, the Hungarian Institute in Tallinn and the Diana Krausz Gallery in Szentendre, Hungary. The exhibition was officially opened by Gábor Szarvas, director for community affairs, environment, health & safety for Budapest Airport. “As airport operator, our aim is to make the travel experience and the time spent at the airport memorable for our passengers. Culture and art are excellent tools for this, and we are happy to provide space for them at the airport. We are especially glad that this exhibition was brought to life based on the idea of a young, talented artist who is an employee of Budapest Airport,” he said. The opening of the gallery was also welcomed by László Kucsák, member of Parliament for Budapest District XVIII, the home district of Budapest Airport. “I am delighted to be involved in the inauguration of this exhibition. It carries significance at local level as well, as the airport is not only the international gateway to Hungary, but also the most important economic entity in our district,” commented Mr. Kucsák. “I wish a lot of success to Budapest Airport for the operation of the gallery, and hope that it will provide an opportunity for artists from our district to showcase themselves at the airport,” he added. This entry was posted in Airlines, Airports, Arts and Culture, Attractions, Entertainment, Flights, Transportation, Travel, Travel Services, Travelers and tagged BUD Gallery, Budapest, Budapest Airport, exhibition, Gábor Szarvas, gallery, Hungary, László Kucsák. Bookmark the permalink.